Ah, the Lompoc Wine Ghetto. So unassuming outside, so delicious inside. Sta. 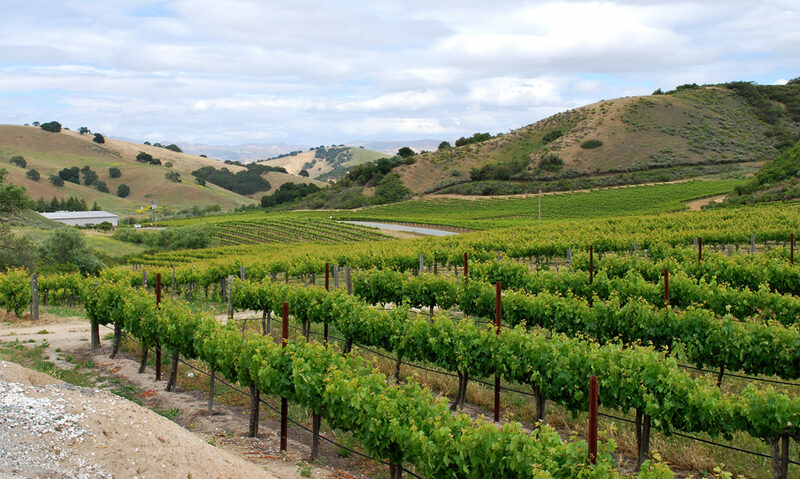 Rita Hills is a teeny tiny little appellation located between Buellton and Lompoc, in Santa Barbara County. Some of the wineries there are so small and personal that they don’t have their own tasting rooms. Enter Antonio Moretti and his Taste of Sta. Rita Hills tasting room. Mr. Moretti is a more than a wine aficionado. Proof? He’s got his own label, Moretti Wine, which you can sample at the tasting room. He also provides an outlet for nine other wineries from the same appellation. With some excellent jazz playing in the background (another of Antonio’s passions) we tasted five wines from Sta. Rita Hills. It quickly became clear why he’s so enthusiastic about the appellation. 2009 Moretti Bianco: This combination of Tocai Friulano, Arneis and Traminer has flavors of apple and pear, and while the fruit is evident it is never too sweet. It’s a bright wine, destined to be enjoyed with food. Nikki also got an impression of citrus and honey and declared that this would be fantastic to have with cheese. 2008 El Rey Pinot Noir: This had a very pleasant and intriguing aroma of oil paint! I know it sounds strange, but there it is. Medium body, good structure from not-too-assertive tannins and an unbelievable dark, smoky character. Some of the flavors reminded me of an artisinal smoked black tea liqueur we have at home. Nikki notes: That liqueur is Qi Black Tea Liqueur by the amazing Hangar One. One of these days our wine travels will bring us to Alameda and we’ll do a whole column or three on Hangar One! There was a lot going on in this young wine, which seemed wise beyond its years. I was quite captivated by this wine, and I’d love to try it after it’s had a chance to mature. I’ll get the chance, too, if you know what I mean. Nikki’s notes indicate a masculine character to the wine – she got hints of leather, tobacco and wood in addition to blackberry, strawberry and patchouli. Nikki adds: It’s no wonder that man of mine would enjoy such a macho wine! 2007 Thorne Estate Pinot Noir: An aroma reminiscent of salami? I’m intrigued. The flavor is one of soft fruit at the beginning, followed by a gentle swell of tannins. There’s a faint but definite flavor of cherries in there too. Nikki noted the fuller body of this wine and a peppery quality accompanying the fruit. 2007 Ken Brown Pinot Noir: The aroma of this one is nice and sweet, full of fruit and just the slightest hint of something savory… dare I say it? A hint of thousand island dressing. Nikki got caramelized blueberries from the aroma. The flavor continues the slightly savory impression with just a trace of sulfur playing off cherries and a delicate layer of oak. The oak hit Nikki’s palate a little harder. This is a full-bodied, complex wine. 2007 Huber Dornfelder: I’m not sure I’ve ever seen a wine this dark. It’s almost opaque, and even the thinnest residue clinging to the glass displays a deep red-purple hue. On the nose you get a beautiful fruity impression with a touch of black pepper. Despite the intense color, this is more of a medium-bodied wine, and the flavor is a bit more restrained than the very fruity smell. This would definitely make friends with food. Nikki found figs and a touch of spice in the flavor.